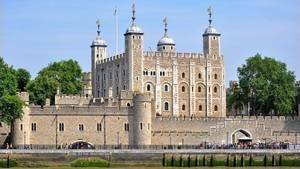 The Tower of London is a fortress located in the heart of the capital of the United Kingdom, London. 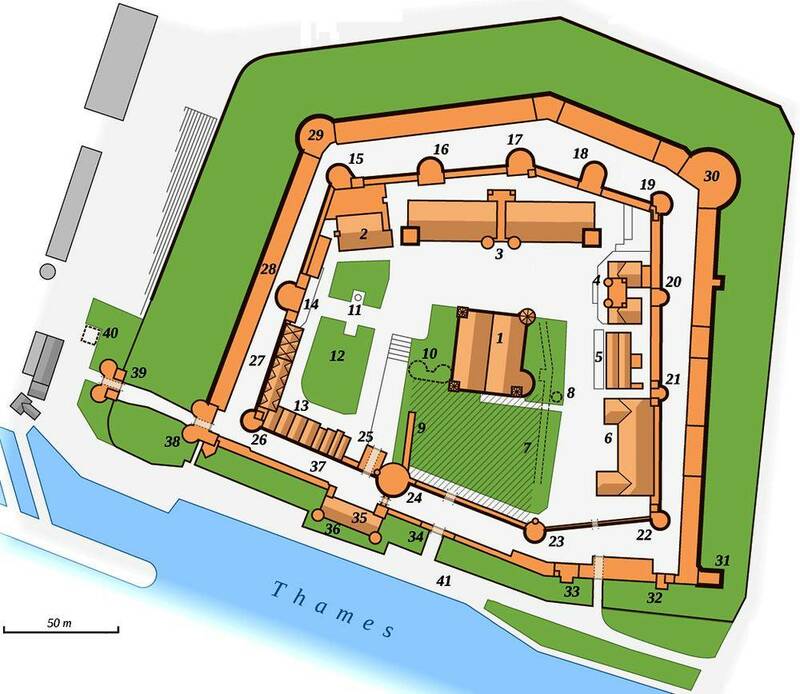 A key castle in the defense of British territory in its entirety, it commanded the passage of ships on the Thames as well as the capital. Those who held this citadel were the masters of the British Isles, it was truly an important fortress, whose history lives up to its recognition in the World. The Byward Towers that guard the entrance to the Tower of London. In practice it is a tower, the famous white tower, tower surrounded by two concentric ramparts forming an irregular hexagon. The interior of the first rampart is equipped with a large number of buildings, forming a real small town on its own. 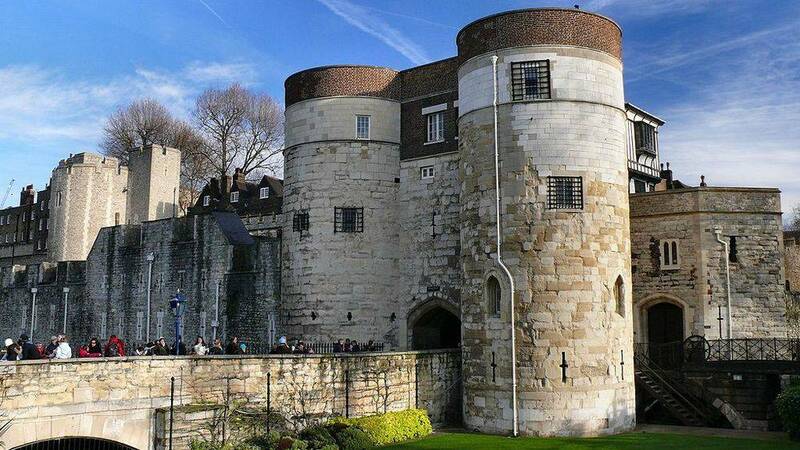 There are not really tours to the Tower of London, but rather a free discovery of the fortress. The gray buildings on the map on the left are the administrative and tourist buildings, where you buy or collect your tickets if you ordered them. The entrance is by the Byward towers (39), the famous twin towers holding a drawbridge. You will have passed the ruins of the Lions Tower before (40). The classic tour leads tourists along the bank street (37), an unofficial name for this street drawn between the two ramparts and skirting the Thames from inside the fortress. It leads you to the three passages to enter the second enclosure via the Bloody Tower (25) for the most known of these passages. You find yourself between the white tower (1), magnificent from this point of view, and the lawns (12) at the end of which is the memorial to the executed (11). The tour of the white tower is not only indispensable but very interesting, you will spend time there. At the end of this visit you will naturally see the jewels of the crown, in the Waterloo barracks (3), then the royal headquarters of the fusilliers (4) and its museum. There is a staircase between this building and the barracks leading you to the ramparts and the circular path that leads you through the North Towers: Tour Martin (19), Brick (18), Bowyer Tower (17) , Devereux (15). The Beauchamp Tower (14) can be visited from the lawn, on the ground floor. A walk in the Mint street will allow you to discover the casemates and its numismatic exhibitions. This is an example of a visit, but the best thing about the Tower of London is to lose itself voluntarily and to ensure, after a while, that we have seen the main buildings because it There are a number of small corners leading to a staircase, a passage or an uncrowded tower that can contain interesting information about the history of London.